STMicroelectronics has recently introduced a new battery-charger management chip that vastly improves functional integration without compromising performance and power consumption. The highly integrated STBC02 IC combines all of the most frequently demanded features for energy management in wearable and portable devices, including linear battery charging, a 150 mA Low Drop-Out voltage regulator, two SPDT (Single-Pole/Double-Throw) load switches, a smart reset/watchdog function, and a Protection Circuit Module that protects the battery from damage under fault conditions. According to independent market researchers IDC , the wearable market reached 78 million units in 2015, with an annual year-over-year growth of 172%. The STBC02 offers the perfect solution for this exciting market, reducing the application footprint and simplifying design, leading to lower cost and faster time-to-market for wearable products across the spectrum of healthcare, fitness, and messaging and socialization applications. All the STBC02 functions are simply controlled via the SWIRE protocol that requires only one microcontroller I/O pin, while the frugal amount of current drawn from the battery during normal operations enables longer battery life. On-demand battery surveillance for the system controller. The STBC02 is available now in volume at a price of US$1.1 for 1,000 units. 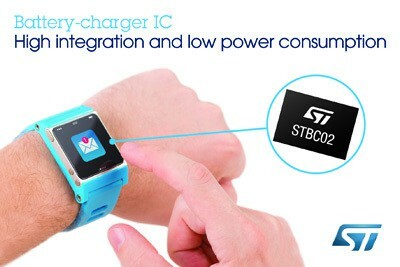 STMicroelectronics Red Carpets battery charger chip for Wearables, Portable Applications 0 out of 5 based on 0 ratings. 0 user reviews.